Hey guys! To end the week, I have anther indie spotlight to share! This is for the etsy seller Not Too Polished. Orange Crush is a fizzy looking orange hued polish that is meant to resemble orange soda/pop. I actually chose to layer this over Gosh Orange Drops because it was a little sheer on it's own and I really wanted to orange to pop! It has sheer/iridescent glitter and shimmers in an orange jelly-type base. I think this a perfect summer color and if you love orange, you will love it! Bubble Party is a gorgeous blue jelly with medium and small glitters suspended throughout. It really does make me think of bubbles so the name is very fitting. I used 2 coats for the pictured look. Love it! Grand Finale is "clear base filled with small and medium glitter in pretty much every color...plus red and multi colored stars". I couldn't decide what color to layer this over so I went with three different ones, Light Blue, Silver, and bright blue. I think I like it over each color as it is unique in its own way for each one. 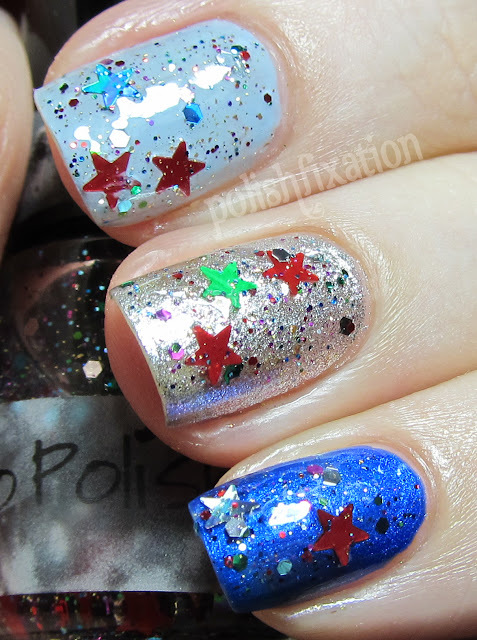 This is a perfect glitter topper if you enjoy shaped glitters. It was very easy to get the stars out of the bottle, as they were so plentiful I personally don't care much for shaped glitters, as my nails are very curved so I can never get them to sit flat for long, then I pick them off! But don't let my personal preference dissuade you from this polish, because it's very pretty! All in all I was quite happy with these offerings from Not Too Polished and will be curious to see what else she comes up with in the future! What do you think of these? Which is your favorite? Grande Finale is my favorite! I don't know what it is about the themed polishes - but I love them! I really like Bubble Party. I really like Orange Crush. I wish it wasn't so sheer though. I wonder how this would look over a pink polish?! Ooh, it's all about Orange Crush for me!!! Orange crush is so pretty!